The cost-benefit ratio plays a major role in the decision of companies to provide vocational education and training for young people. 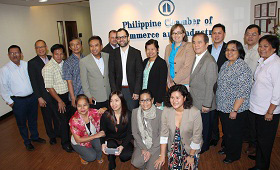 The BIBB supports its co-operation partner, the Technical Education and Skills Development Authority (TESDA), and the Philippine Chamber of Commerce and Industry (PCCI) on site in the Philippines in their preparation of a cost-benefit analysis, thereby supporting the Philippine government's reform of the education system. The Philippine government intends to improve the quality of vocational education and training in the Philippines with its K to 12 reform. In future, the vocational training provision is expected to be more closely aligned to the real demands of the workplace and the labour market demands in order to equally satisfy the demands of a modern economy and of the (largely informal) SME sector. The reform aims at improving the occupational guidance mechanisms for young people and their practical and technical qualification within the formal education sector. The Philippine government moreover pursues the objective of increased inclusion of businesses in the vocational education and training process and intends to make businesses more aware of the economic benefits of providing vocational training. The cost-benefit ratio plays a major role in the decision of companies to provide vocational education and training for young people. This is why at the beginning of this year the BIBB advised its Philippine partner institute the Technical Education and Skills Development Authority (TESDA) as well as the Philippine Chamber of Commerce and Industry (PCCI) regarding their preparation of a cost-benefit analysis in the Philippines. During a workshop on the topic of "Costs and benefits of vocational education and training", the Philippine partners learned about the implementation of cost-benefit surveys in Germany and the options for adapting these to match the relevant context in the Philippines. An important aspect here was the identification of key Philippine stakeholders, who need to be won over for the successful implementation of the analysis. The BIBB supports its partner institute TESDA in the context of the K to 12 Plus Project – Pilot Project Dual Training in the Philippines on behalf of the worldwide active non-profit development organisation sequa and Philippine stakeholders. The project is part of the K to 12 reform in the Philippines. The BIBB has been maintaining an institutional co-operation agreement in the field of vocational education and training with the Philippine Technical Education and Skills Development Authority (TESDA) since September 2014. The Philippine partners in the K to 12 Plus Project are the Philippine Chamber of Commerce and Industry, the Cebu Chamber of Commerce and Industry and the Department of Education, in addition to the TESDA. The German project partners are the Association of Catholic Entrepreneurs / AFOS Foundation for Entrepreneurial development co-operation (BKU/AFOS), the German Investment and Development Association (DEG), the Association of German Chambers of Industry and Commerce / the German-Philippine Chamber of Commerce and Industry (DIHK/GPCCI), the German Society for International Co-operation (GIZ), the Savings Bank Foundation for International Co-operation (Sparkassenstiftung), the sequa organisation and the German Confederation of Skilled Crafts (ZDH).